Now comes the glut of tomatoes I long for all winter. 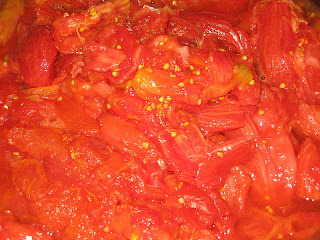 Meals of tomatoes, snacks of cherry tomatoes, picnic lunches with oven roasted tomatoes on crackers, and bags of sauce, salsa and paste filling the freezer. This evening, a one pound fifteen and a half ounce tomato, sliced with fresh mozzarella, and gobbled up with just a drizzle of olive oil, vinegar, and the smallest pinch of sea salt. And not just some thick-skinned, flavor-deficient hybrid that can be packed and shipped around the world; no, this was a beautiful Brandywine - Glick's Strain, a tomato I've grown for a decade and whose seed I keep and replant each spring. And the sauce I made this weekend was made with a tomato called 1x6, so called because it's a long, tapering tomato that can reach six inches. And, it's about 1" across at the top and has very few seeds, making it a great sauce tomato. I've got a half-finished batch of salsa in the refrigerator and seeds fermenting in the garage; they attract a lot of fruit flies so I like to keep them out of the kitchen. Can you send me and Holly some of your seeds? When they're dry I'll send you some!